This is a 5 reel online slots game filled with Irish charm and mischievous leprechauns trying to stop you along your path. Travel to the end of the rainbow by spinning your way to the 10,000 coin treasure trove and uncovering horseshoes and Irish Luck charms to win you other prizes. Providing the complete solution to all gaming needs, Playtech delivers a full range of products and services to a variety of platforms. With a unique gaming experience on offer, via interacting with the diverse range of immersive titles, Playtech capture the imagination of their customers, with a series of top-quality, highly-playable titles. If you're looking for great slot games then Pariplay is a good place to start! Pack your bags and prepare yourself for a lucky leap over to The Emerald Isle…. Unless you already live in Ireland, in which case head to your favourite device and get ready for some big wins. 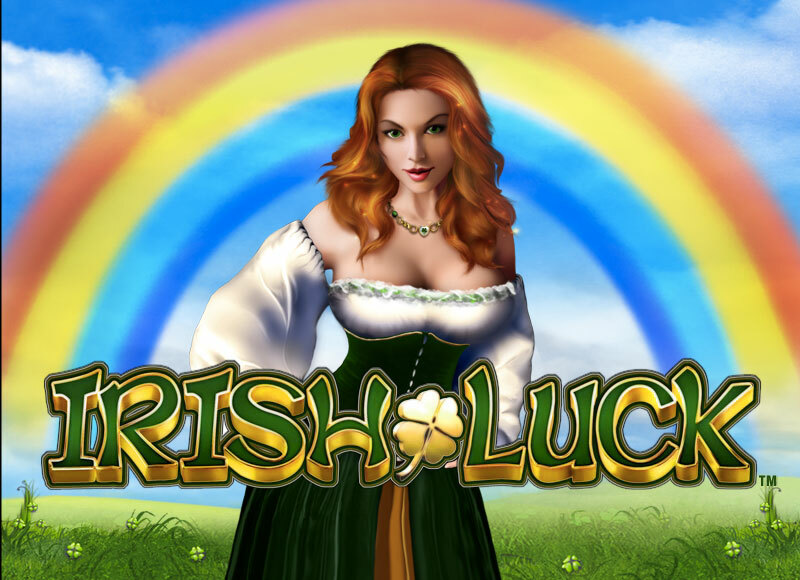 Irish Luck is a 5 reel, 30 pay line online slot game from Playtech, packed with a range of big bonuses, hefty wins, and charming Irish character galore. From £0.01 to £150, we can feel that little extra dash of luck that makes a good gaming session a great one. With lush, Emerald Isle green and a perennial rainbow on our screen (which of course means a pot of gold is never far away), the variety of ways to win in Irish Luck are delightfully plentiful. Green card symbols 9 through A are the lower value wins, but they are always surrounded by dazzling Golden Harps, Four Leaf Clovers, Celtic Brooches, Golden Horseshoes, and Silver Rings - which can all trigger some pretty substantial wins themselves. The Ring and Horseshoe are the most valuable of the regular symbols, but the symbol we most desire is certainly the Wild. 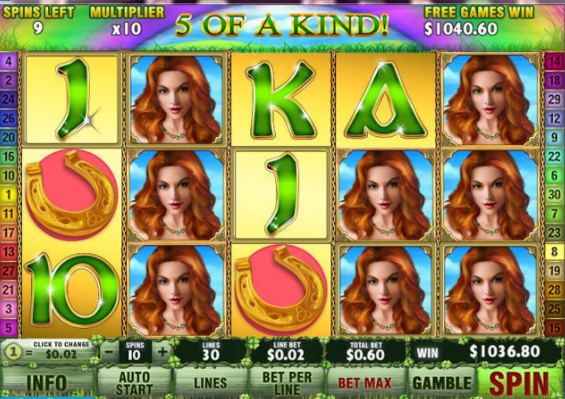 The sultry, red-headed Wild of Irish Luck may be one of the hottest Wilds anywhere in online gaming. She can become Stacked on all reels and will substitute for any other symbol than the Scatter, plus, doubles the value of every win. If your Irish Luck is high enough, you might find yourself with 5 of her on a single pay line – and a 10,000 coin reward! 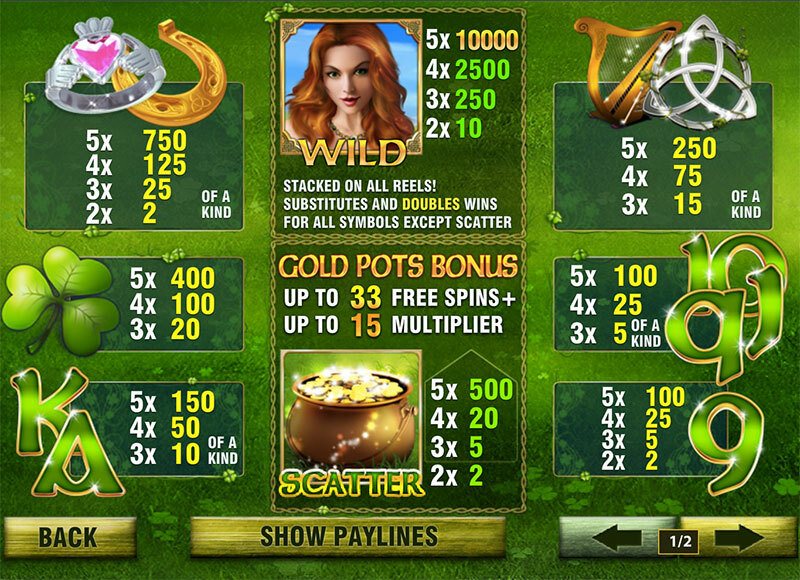 The Free Spins feature is triggered by landing 3 or more of the Golden Pot Scatter symbols. While this will initially trigger 8 Free Spins before they play out we get a quick game of chance. This could, of course, enhance the multiplier on our Free Spin wins and give us a few more Free Spins in the process. During this feature, we actually have the chance to activate a massive 33 Free Spins! Although this is the only Bonus Feature of the game, it can certainly be a pretty rewarding one! And with the vibrant graphics and catchy, Irish-themed audio and sound effects, the game is fun enough to enjoy a few spins while we wait for the Bonus to reveal itself. And with the Luck of the Irish, it usually does! 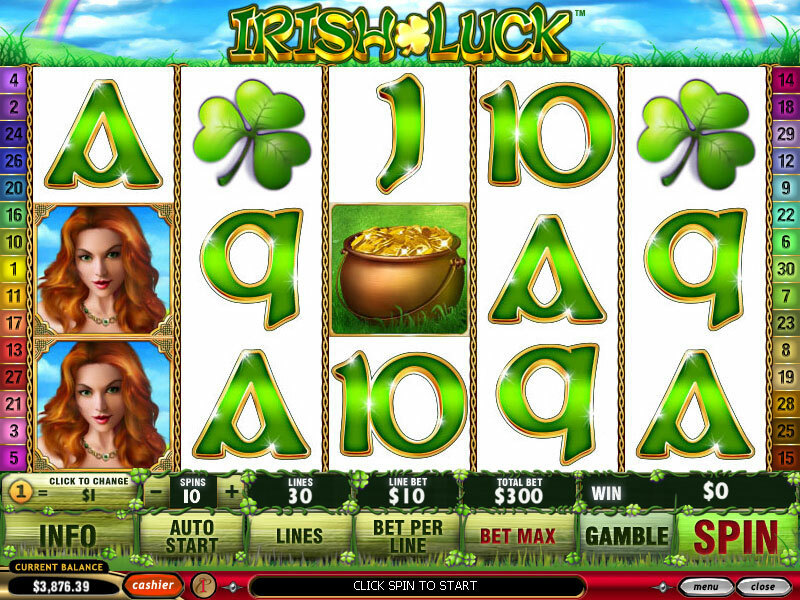 This 5 reel Playtech slot brings a fresh feel to the Irish theme in the world of online gaming. The Wild symbol alone is worth a few spins, and the playful charm that has been carefully built into the game keeps it fun and engaging. The number of Free Spins we can trigger in just a few turns on the reels is immense, and this certainly makes the game worthy of a solid 8/10 from Dream Jackpot. Another fantastic game is our Barn Ville slot.